Tired of diet plans or long exercise sessions at the gym without seeing results? Want to sculpt your body and melt away excess fat without the pain, potential damage or recovery time associated with procedures like cool sculpting or liposuction? Red light therapy can help you lose the inches you want, melt away the fat, and get you back into your favorite clothes again, all without yo-yo dieting, rigorous exercise regimens, pain, scarring or recovery time. All it takes is two sessions a week for about 8 weeks on average, though some clients need more sessions to achieve their goals. We custom-tailor our programs to meet your goals and your budget! Enjoy relaxing sessions in our comfortable, spa-like setting, as you let the red LED lights do their work. No pain, no discomfort. Ready to start losing inches and get back into the clothes you love? Take the first step today! "The process and environment is relaxing." "I love the spa-like environment"
"Totally worth the time I invested"
"My friends tell me how good I look"
"I dropped 2 dress sizes!" Red light therapy works by emitting two different wavelengths of red light. The first wave causes the cell membranes in your fat cells to open up, allowing the fat contents to liquify and seep out, where they can be burned as fuel or processed by your lymphatic system and eliminated from the body. The second wave increases collagen and elastin production in the skin that can correct the appearance of fine lines and wrinkles, while also creating a slimmer appearance. Whether you have a few problem areas, like the hips and thighs, or need a full-body solution, Health by Design has you covered. Unlike low-end solutions that use cheap LED lights and stationary light bars, our LED lights are applied to your whole body using a full-body wrap. This creates even coverage and reduces the amount of sessions you need to see results. In fact, many of our clients see noticeable results after their first treatment! Want to know more about red light therapy? Depending on how many inches you want to lose, it typically takes 12-16 sessions to complete your plan. You could lose up to 30 inches in just 8 weeks, with just two sessions per week. And the best part? By naturally shrinking the fat cells as fat is released, red light therapy enables your body to maintain your inch loss after your sessions are complete. Of course lowering your caloric intake and participating in moderate exercise will help you maintain your inch loss much longer. 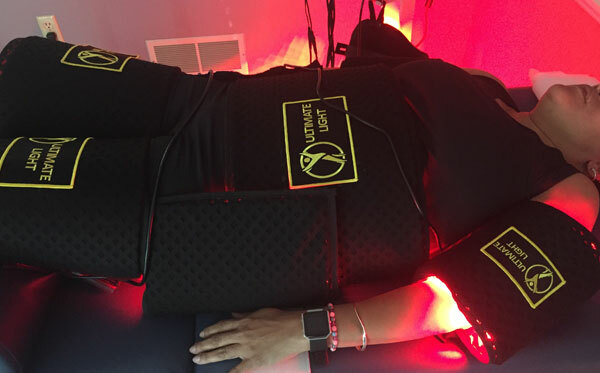 While red light therapy has been approved by the FDA and is a proven technology with over 40 years of history, care needs to be taken to protect your body from rapid fat loss. That's why, when you work with us, you'll work with licensed health professionals who understand what it takes to lose fat safely. It all begins with a complete health review from Traditional Naturopath, Jeannie Peck. We'll evaluate any health concerns and make sure you are healthy enough to lose fat and sustain your new inch loss. We'll also recommend a liver cleanse to safely remove toxins from your body, along with liver support vitamins. We also offer optional nutrition counseling to help you maintain your inch loss, lose weight, and improve your long-term health and well-being.